You’ve heard the phrase “Make Half Your Grains Whole”, meaning that the average American should be eating about 6 servings of grains per day, half of them consisting of whole grains. Have you ever wondered how to make this happen for you and your family? The USDA has some great ideas to get started. The problem is, with all the words on the label, oftentimes it can be difficult to identify the whole grain foods from the refined grain foods in the supermarket. 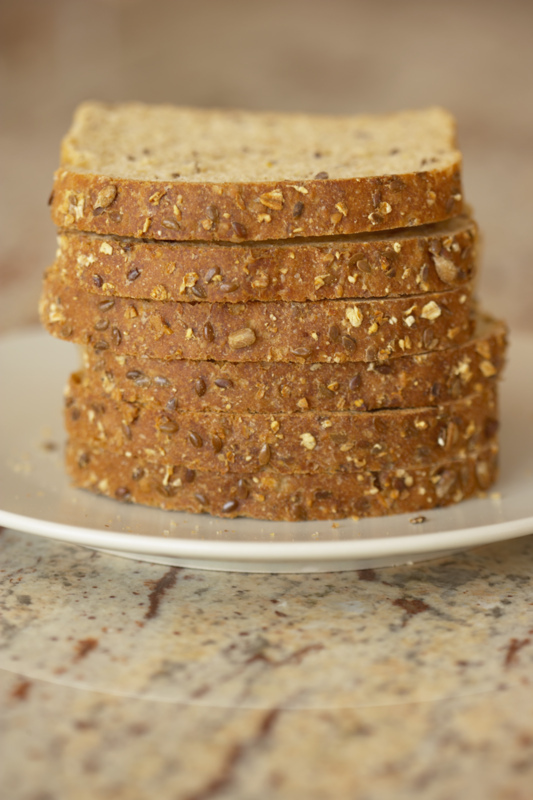 This article will help you identify whole grain breads next time you go shopping. You cannot judge a book by it’s cover when it comes to choosing a whole grain bread. Breads can be colored brown to resemble whole grains even though they are actually made with refined wheat. Choose a fresh looking loaf, flip over the package and check out the nutrition label (don’t forget your glasses!). The most important thing to look for is the phrase “whole wheat” as one of the first ingredients. If it just says “wheat,” “7-grain” or “enriched wheat” that is not a whole grain. Enriched just means that a vitamin that was lost during processing was added back to the flour afterwards. (This has been required by US law for B-vitamins since 1942). The ingredients that are listed first in the ingredient list are those that make up most of the product, so it is important that “whole wheat” is one of the first ingredients. Congratulations, you have found a whole grain bread! This bread will be superior to refined wheat breads because the whole grains contribute important vitamins, minerals and fiber. If you identify a few whole grain breads, compare the prices, the number of slices per loaf, check out the labels, the amount of fiber per slice (5 grams per slice is excellent) and the freshness date. Always inspect the bread for mold and make sure to buy the one with the most recent date on the tag.